Why date Anime, Manga, Sci-Fi fans and Otaku? If you've ever met an Otaku, you might think they're all pretty much the same. Living with their parents well into late ages, eating nothing but ramen noodles, and not being a productive citizen. Well, this idea isn't always right - many Otaku can be engaged citizens... some are even building mechs in their backyards. Who wouldn't want to date someone with a legion of giant robots at their disposal? 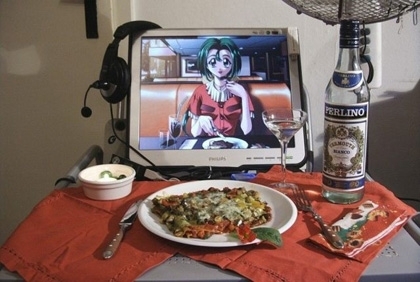 And beyond this, there are plenty of awesome reasons to date an Otaku. Most of us are useful. In this tech-savvy world, it’s great to have a boyfriend or girlfriend who can make your laptop, desktop, and just about anything else that plugs into a wall behave itself. My Otaku friends know just about everything there is about computers. Chances are if you're here, you might learn from each otehr. We're reliable and well-meaning. While geeks and nerds may be awkward, Otaku are well-meaning 9 out of 10 times. That smooth dude with the sly grin and the spider hands? Wonder what HIS intentions are... plus, you never have an otaku not call when they say they will. We're romantic. More than given credit for. Ok true, my otaku friends' idea of romance might be to make up a spiffy web-page with all the reasons why we love you, with links to pics of you and sonnets and such... but it still lasts longer than flowers, plus you can show your friends. We're numerous. There's not much time outside of conventions to meet other people with our interests - and the ones near us are always inside on their computers (like you are right now). Due to this, there are plenty to choose from. We’ve got brains. Come on now, how can intelligence be a bad thing, unless you don't like being shown up in chemistry class? A few too many of my Otaku friends are even smarter than me. Most of us are quite good at remembering dates. Like birthdates and such, especially if they know it’ll make you happy. Due again to their neglected status, they’re more attentive than guys who "have more options". Plus, with all that down time without a steady girlfriend/boyfriend, they’ll likely have mental lists of all the things they’d love to do once they GOT one. We’re relatively low-maintenance. Most of us can be fueled on pizza and Mt Dew. No complicated dinners needed here, so if you’re not the best cook, eh. Can you order a pizza and play an anime movie? Most frequent bars as often as slugs frequent salt mines. You won’t have to worry much about your geek guy or girl getting their "groove" on with club hotties because, frankly, they’ll be too busy rooting around under a computer wondering where that spare cable went. Easy to do stuff with. Although they may not want to go to every outing with you, you can arrange swaps, as in, you’ll go to a Gamer Con dressed as an elf princess or prince if they’ll take you where you want to go... if it's not the same convention :). Their friends are nice too. For girls, you’ll more likely get "Omg! A GIRL!! Can I see?!" than "Hey hot stuff back that up here and let me get some grub on..." They’re awkward geeks too and will, 9 times out of 10, treat you with the utmost respect and, more than likely, a note of awe. A cute girl picked one of their clan to date? It could happen to them! Hope! Drag some of your single girlfriends over, open up a pack of Mt. Dew, crack open the DnD set and get working. Nothing impresses geek guys more than a girl who can hack-n-slash (well ok maybe if she can code... a geek can dream). They’re rarely if ever possessive. They trust you, so you can be yourself around them. You like to walk around the house in a ratty t-shirt for comfort? They won’t care, they do too! They'll actually give a damn about you. Not how you look (though that’s a plus), not how skinny you are, but they like you for your personality and brains. That kind of thing lasts longer than anything else.